Here are a couple of videos of Professor Paradox, one is a short sequence taken at Priddy Folk Festival a couple of years ago, the other is an extract from a TV documentary by John Nettles showing a few bits of a show, and a short interview. I have loads more snippets of video from various events, but I haven’t had time to edit them, so for now these will hopefully give an impression of what I do. Oh and in case you are wondering, this is the ORIGINAL Professor Paradox – Professional clown since 1987. Beware of tacky imitations ..! The videos on this site are of the original Professor Paradox who has been bringing laughter and joy to families and children at arts festivals, events, schools, and parties since 1986, and not the Ben 10 character who couldn’t think of an original name and pinched mine instead! The original Professor Paradox became a fully professional clown in 1987. 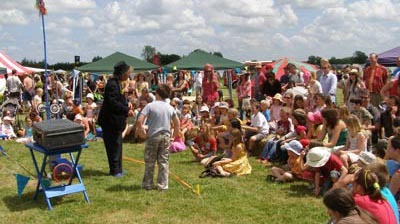 If you want to more about Professor Paradox and his legendary children’s shows, including the famous Pirate Show, and his Christmas themed party show, then take a look at the rest of the site, which has lots of pictures of Professor Paradox along with information, tips, and ideas for entertainment at children’s parties and events.